Do you know if your kids are learning and retaining all that they need to know in math? I’m not sure any of us know until they are much older, in some cases. 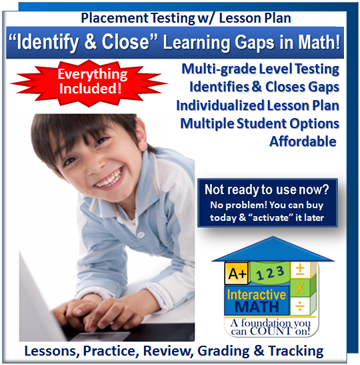 A+ Interactive Math has a wonderful program called Adaptive Placement Test and Individualized Lesson Plan that can help you determine whether or not your child has any learning gaps in their math AND helps your child close those gaps. Our family has been given a complimentary subscription to this program to use and review for all of you. One of the many perks of being on the TOS review crew! Some of the other crew members reviewed their Family Math Packages if you want to check that out as well. Just click on the ‘read more’ banner at the end of the post. When you purchase the plan, you tell the program what grade your child is in and then your child will take “mini” assessment tests on various math concepts they should know based on their grade level. If they test below grade level on any of the tests, a lesson plan is devised for them. This lesson plan is designed to bring them up to grade level and close the gaps! The lesson plans include videos to watch and practice questions, as well as practice tests, which the program calls worksheets. Once your child has completed all the videos and worksheets, they can retake the mini test. The mini tests do not take long to complete… Only about 20 minutes, depending, of course, on the child taking the test. There are approximately 10-15 mini tests per grade level, depending on how many concepts are generally taught in that grade. The tests are adaptive. So, if your child is at the current grade level for the skills in a particular test, then they will complete the test in 15-20 minutes. If they are getting some questions wrong, the test will offer more questions to help determine the grade level your child is at for that concept. If that happens, it may take longer than 20 minutes for that particular mini test. We have completely replaced our current math program so that my son could concentrate only on this program. You don’t have to do it this way. I did it, because I knew he was behind on certain concepts, so I thought this would be the best way to bring him up to speed. Plus, you only get a 3 month subscription to the program, so I wanted to make sure he would have plenty of time to do all that was needed. Although, you can always purchase another 3 months if your child is taking longer to get the work done. If he gets done with a lesson really quickly, then he just does more than one lesson in a day. The same for the worksheets. If he is “getting” the information, then he will finish it quickly. So I just have him do a few in one day since it is the only math he is doing right now. Overall, I have been very happy with the program. My son is really understanding the concepts that are presented and that is a great thing!! Also, they are offering a sale right now!! For 2 weeks, they are having a 40% to 50% off sale on their “Family Math Packages” (which some other crew members reviewed) and “Adaptive Placement Testing w/ Lessons” from 5/4/2015 until 5/18/2015!!!! What is it? a program from A+ Interactive Math called Adaptive Placement Test and Individualized Lesson Plan that tests your child based on grade level and then gives him/her a lesson plan based on the results of that test. It is meant to fill in the gaps, if there are any. For whom? Anyone interested in seeing if your child has learning gaps in their math knowledge. How much is it? $29.99 for the first student (special promotional limited-time offer) and each additional student is $10 for a 3 month subscription.